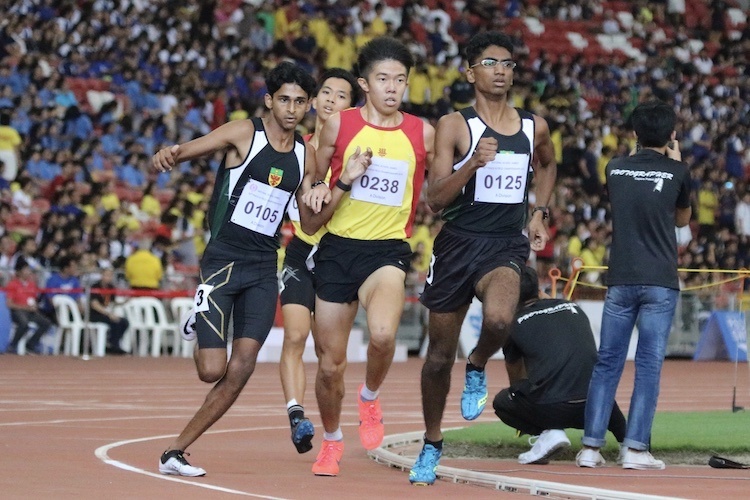 Teamwork makes the dream work for RI's Selva and Armand and HCI's Vera and Pei Xuan, who clinched 1-2 victories for their respective schools in the A Division Boys' and Girls' 1500m finals. 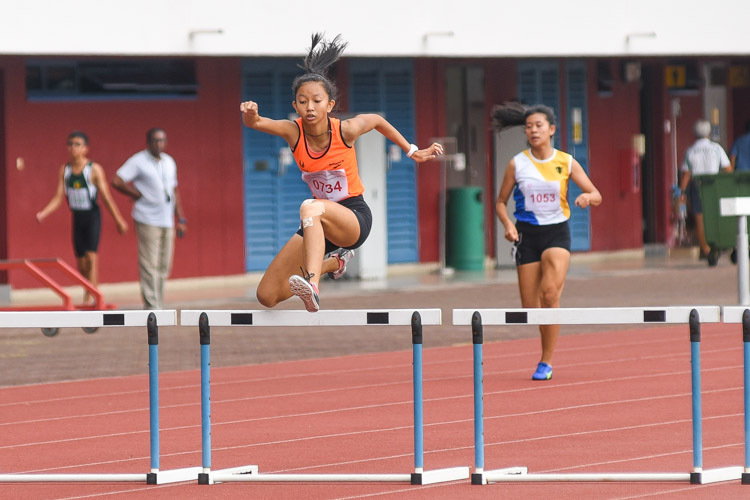 Raffles Institution (RI)'s Valencia Ho secured her third sprint hurdles title at the annual National Schools Track and Field Championships when she crossed the finish line first in the A Division girls' 100-metre hurdles final, stopping the clock at a personal best 15.25 seconds. It adds to the B Division gold she won in the event last year and her C Division 80m hurdles win in 2015. 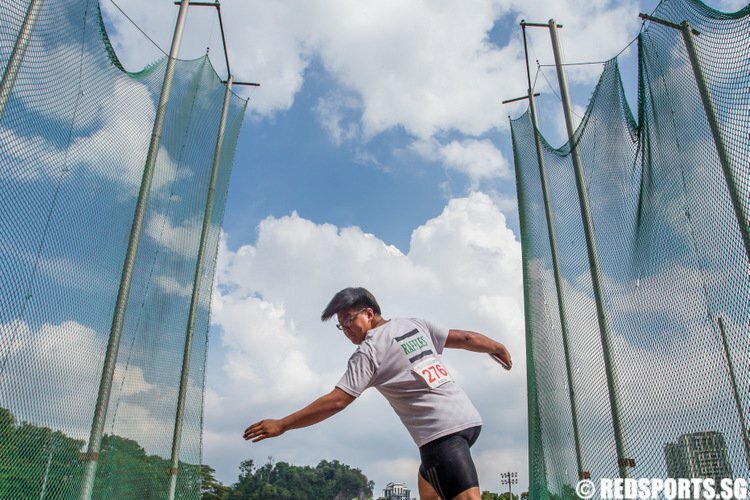 Between those, the former Nanyang Girls' High School (NYGH) athlete still earned silvers losing to teammate and record-setter Elizabeth-Ann Tan in the C girls' race in 2016, and to Singapore Sports School (SSP) alumna Rachel Chin in the 2017 B Division final. 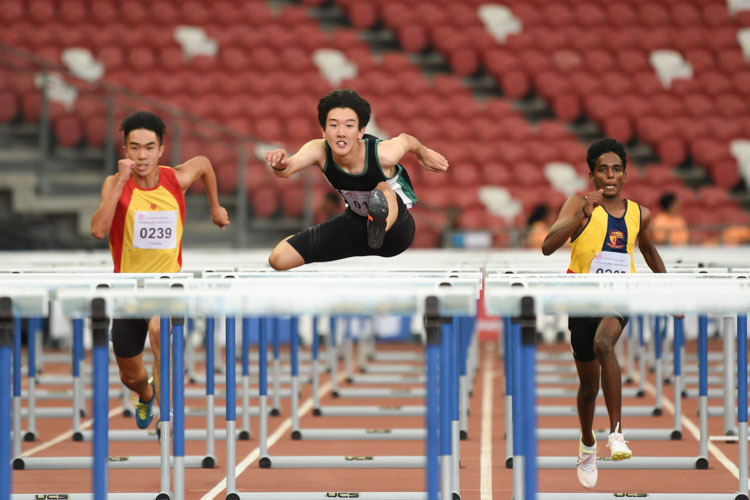 Victoria School (VS) made it two in two at the 60th National Schools Track and Field Championships, clinching the gold medal in both the C Division Boys' 100-metre Hurdles and B Division Boys' 110m Hurdles finals through Simon Azulay and Gabriel Lee respectively. Stopping the clock at a personal best of 6 minutes and 54.53 seconds, Loh Wei Long of Yuan Ching Secondary (YCS) stood tallest atop the podium among the traditional powerhouses of track after taking on the B Division Boys' 2000 metres steeplechase final at the 60th National Schools Track and Field Championships. 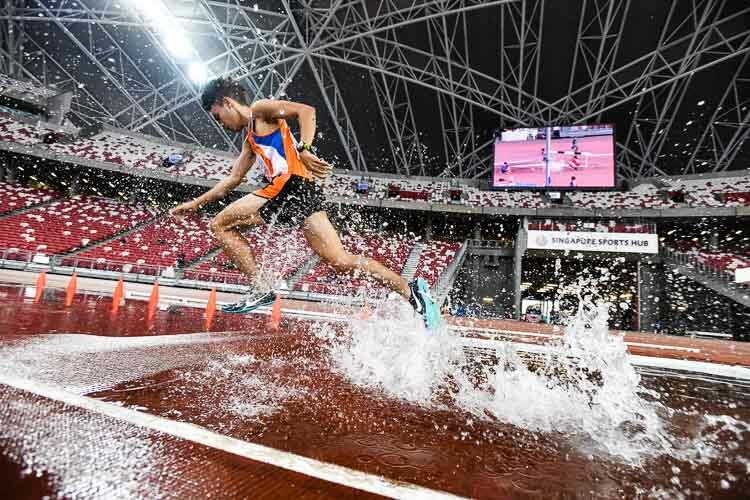 This was only the second time that Wei Long has competed in the steeplechase but he remained unfazed as he seized his first individual gold -- which was also the only gold that Yuan Ching Secondary garnered at the meet -- while breaking his personal best which was set at 7:02.17 during the heats. 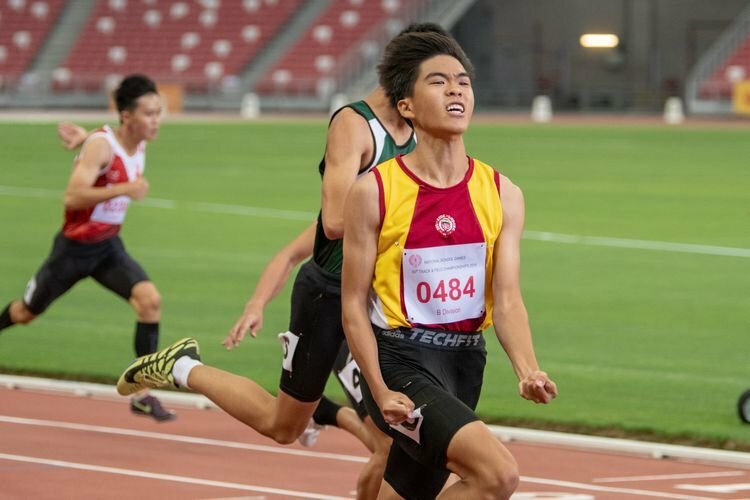 Aeron Young and teammate Jonathan Yeong of Hwa Chong Institution (HCI) finished seconds behind of the victor with timings of 6:58.49 and 6:59.39 respectively, clinching silver and bronze for their school. 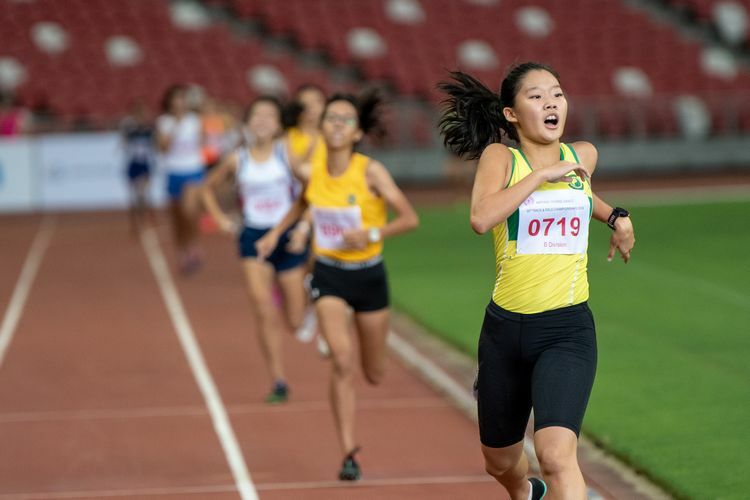 The last stretch of the B Division Girls' 800-metres final saw Emily Ong of Singapore Chinese Girls' School (SCGS) pushing across the track to hit top speed and secure gold in a swift 2 minutes and 24.53 seconds. Her timing is the fastest clocked in the girls' B Division in eight years, since Ranjitha Raja and Wendy Enn recorded 2:22.02 and 2:23.03 respectively in the 2011 final. 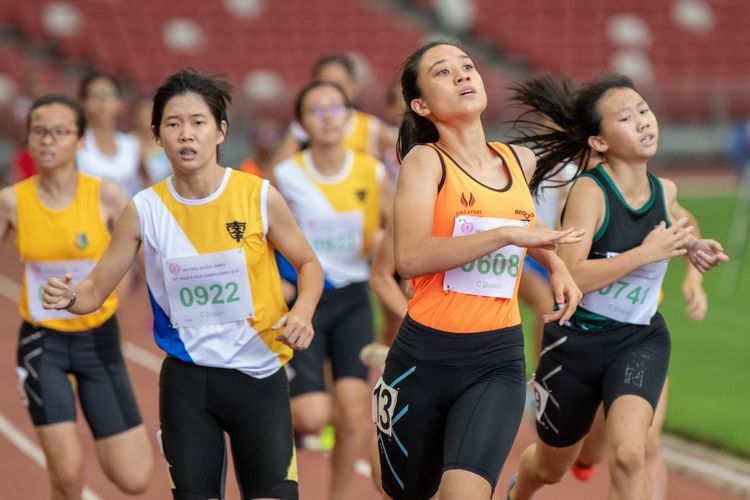 Singapore Sports School's (SSP) Olivia Sallit bagged the gold in the C Division Girls' 800 metre final, while Mervyn Ong of Nan Hua High School (NHHS) emerged victorious in the C Division Boys' final. 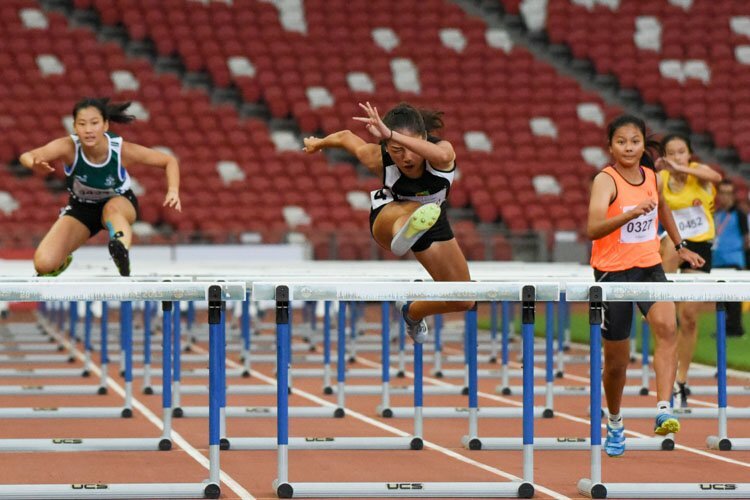 In likely their final time competing in the event for Singapore Sports School (SSP), Tyeisha Rene Misson Khoo and Irsyad B Mohammad Said made it a swansong to remember as they struck gold in their respective B Division 400-metre hurdles finals.